Your diet can have a significant impact on the planet. In 2016, resolve to make greener decisions about the types of foods you eat, the processes used to produce them, and the places you shop. The following seven tips will help. Eat more plants, fewer animals: Livestock production is responsible for 14.5 percent of global greenhouse gas emissions, according to the U.N. Food and Agriculture Organization. 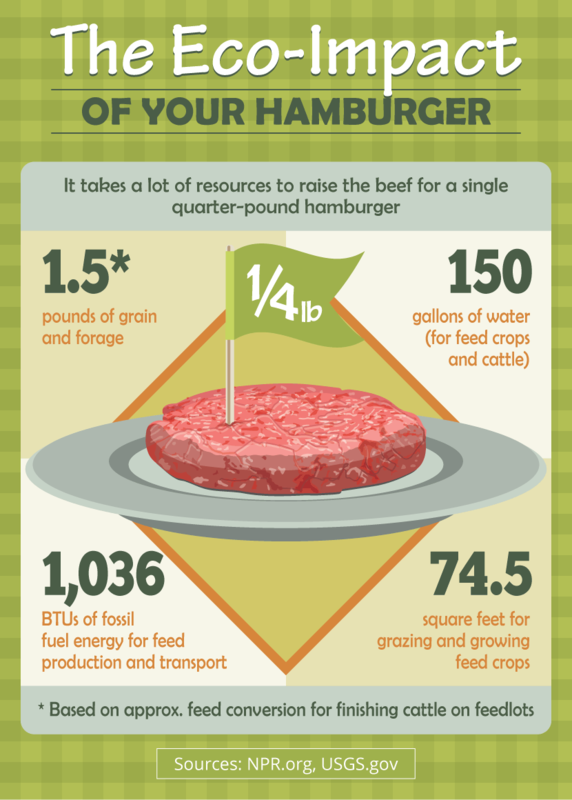 Cattle (raised for beef or milk) are responsible for the most emissions. You can cut your carbon footprint in half by adopting a vegetarian or vegan diet. If giving up meat and dairy sounds too daunting, focus on reducing your consumption: pour soy or almond milk on your cereal and plan a few meatless meals every week (vegetarian lasagna, anyone?) to shrink your eco impact. Opt for organic: The chemicals used to grow conventional (non-organic) produce take their toll on the environment. Organic growers use production methods like crop rotation, cover crops, and low- or no-till practices that actually benefit the environment, while steering clear of toxic fertilizers and pesticides that leach into the groundwater. Look for produce with the green and white “USDA Organic” labels at the supermarket. At the farmers’ market, ask farmers about their growing practices. Organic certification is expensive and some smaller farmers might not be certified but are still growing organically. Go local: On average, foods travel 1,500 miles from the farm to your plate. But cutting transportation-based carbon emissions isn’t the only reason to choose foods produced close to home. Fresh produce is often picked green (so it’s not overripe when it arrives at the supermarket) and then treated with ethylene gas when it reaches its destination to speed up ripening. Foods that are picked at peak ripeness – like the fruits and vegetables sold at the farmers’ market – often taste better, too. Local farms also help preserve agricultural land and provide important habitat for wildlife. 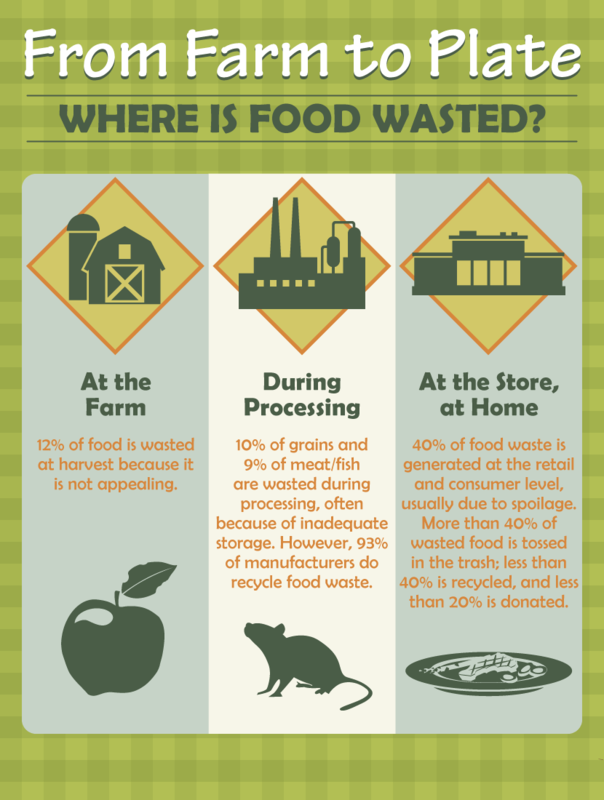 Reduce food waste: In the United States, 31 percent of the food grown and raised – the equivalent of 133 billion pounds of food per year, according to the U.S. Department of Agriculture – is never eaten. Instead of sending uneaten food to the landfill, where it contributes to the production of methane, a powerful greenhouse gas, think about ways you can reduce food waste. Create a meal plan, stick to the list at the supermarket, and make leftovers part of your weekly menu. At the supermarket and farmers market, don’t be afraid to buy “ugly” fruits and vegetables like crooked cucumbers or blemished peaches. The less-than-perfect produce is oven overlooked and sent to the landfill even though it tastes just as good as more beautiful fruits and vegetables. Learning to preserve foods by pickling or canning produce means that you’ll have less food waste, and some seriously tasty foods in the cupboard! Shop for Fair Trade products: The Fair Trade logo appears on products like coffee, sugar, tea, grains, wine, coconuts, and chocolate. It’s a certification that promises that products produced overseas were made by workers who earned a fair wage under safe working conditions. Fair Trade certification also requires that producers, like farmers, follow strict environmental standards by offering incentives for organic conversion, water conservation, and reforestation. In 2014, the U.S. imported more than 194 million pounds of Fair Trade produce – a 26 percent increase over 2013 – which means it’s easier than ever to load your cart with Fair Trade foods at supermarkets, warehouse clubs, and specialty stores. Rethink palm oil: Palm oil is a common ingredient in foods like margarine, ice cream, pizza dough, and instant noodles – and more than half of the packaged products sold in supermarkets, according to World Wildlife Fund. The plantations where palm oil is produced have drastic environmental impacts, including soil erosion and air pollution. Clearing the forests for palm oil production also results in loss of habitat for endangered species; palm oil production is one of the biggest threats to the orangutan population in Southeast Asia. In recognition of the environmental damage caused by palm oil production, some producers are making Certified Sustainable Palm Oil, which means the plantation meets strict environmental standards. 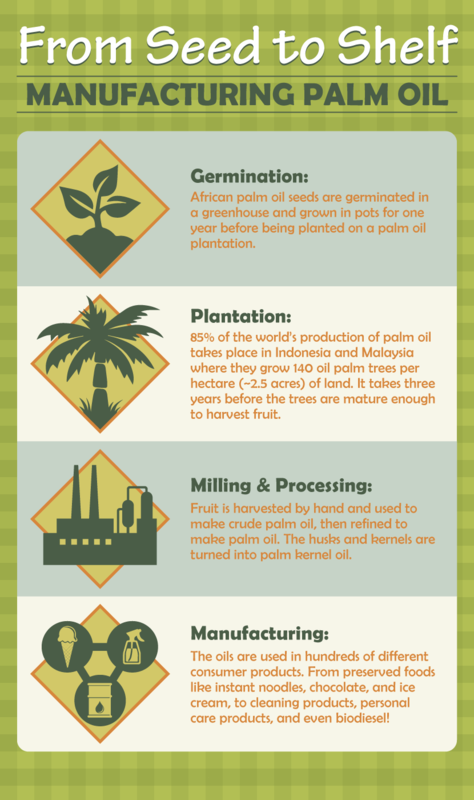 In 2013, 15 percent of the world’s palm oil was certified sustainable. Unilever committed to sourcing 100 percent of its palm oil sustainably by 2020 – an indicator that it’s getting easier to find products with sustainably-sourced palm oil. Switch to tap water: When it comes to environmental impact, bottled water is making waves. Producing bottled water for the U.S. market takes an average of 17 million barrels of oil – enough to fuel one million cars – according to environmental non-profit The Pacific Institute. Although most plastic water bottles can be recycled, 80 percent end up in the landfill where they take more than 1,000 years to biodegrade (bottles that are incinerated produce toxic fumes). The nonprofit environmental organization Food & Water Watch notes than more than half of all bottled water comes from the tap and both bottled and tap water are equally safe. When it comes to drinking H2O, the best choice is investing in a filter and a reusable water bottle instead of chugging from plastic bottles. 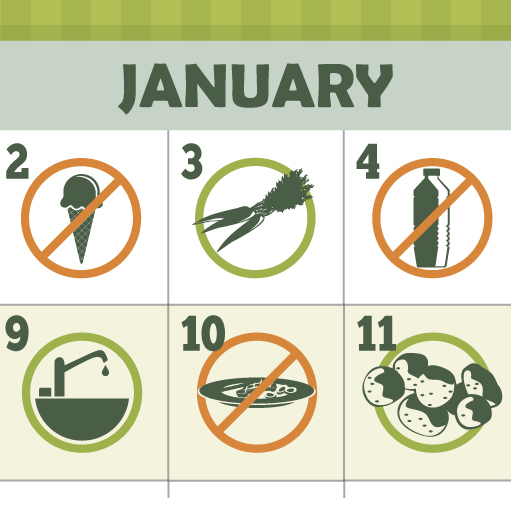 As we head toward the new year, get inspired: 2016 could be the year you make some lifestyle tweaks that benefit your own health and the health of the planet!